Founded in 1988, Groupe Info Consult was one of the first companies in Canada to venture into the world of digital mapping. It is part of Groupe LPA, a company formed in 1970 and which also counts Luc Pelletier & Associés as a member of the consortium. Backed by a wealth of experience, Groupe Info Consult is able to offer a full range of geomatic services. This fast-growing field includes mapping, surveying, digital imaging, photogrammetry, 3D terrain modelling, and much more. We have all the necessary resources under one roof, whether to create or update a map, obtain a location certificate, take aerial photos, or carry out a LIDAR survey. Our team of experienced professionals has received several awards of excellence from Natural Resources Canada. 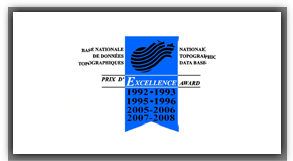 We have also repeatedly won the Award of Excellence from the Centre for Topographic Information (CTI) - Sherbrooke, the latest in 2008. Our company has also been ISO 9001 certified since 1996.